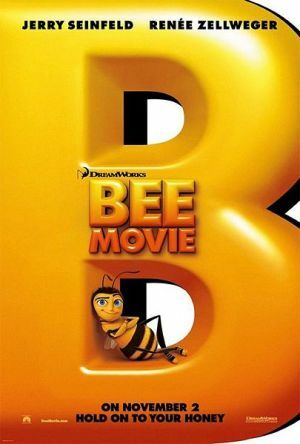 Bee Movie is a 2007 CGI animated feature film produced by DreamWorks Animation and co-written by and starring Jerry Seinfeld. Barry B. Benson (Seinfeld), a bee who has just graduated from college, is disillusioned at his lone career choice: making honey. On a special trip outside the hive, Barry is rescued by Vanessa Bloome (Renée Zellweger), a florist in New York City. As their relationship blossoms, Barry discovers that humans actually eat honey, and subsequently decides to sue us. Acoustic License: There are numerous cases when you have to wonder how is it possible that everyone can hear a tiny bee crystal clear, no matter the distance. It gets especially stupid during Barry's speeches in the court, where he doesn't use a microphone or anything like that, and yet everyone can perfectly hear him. And on a related note, when Barry gets promoted to a Pollen Jockey and puts on his new uniform, Vanessa can perfectly see it. Despite Barry standing on top of a plane's wing and Vanessa standing probably a good distance away. Alliterative Name: Barry B. Benson. A bee stinging a man and surviving by replacing the stinger with a plastic sword, and the whole bit about pollination; the moment the bees stop pollinating, every plant dies despite the fact that pollination would only stop new flowers from being made, and plants would live as normal (especially obvious with the trees that would still live for years), and the pollen being reintroduced bringing them all back to life. Also, it is impossible to pollinate most flowers with pollen from other species. Even if the bees stop, there's still the hummingbirds/butterflies/etc to pollinate as well. Losing every bee would be catastrophic (especially for farming), but bees don't have dibs on all pollination. In fact, many species don't even need animals at all, relying on the wind alone for pollination, and would be perfectly fine and ordinary. The humans return a huge keg of honey to Barry's hive... but it's still one keg and that's still only one bee hive out of the countless amounts of honey already distributed in the world, and the countless number of bees living in countless amount of bee hives! This may have been simplified for the story to be clearer and this epic, but Barry's hive can't possibly be the sole producer of honey! Sting (the singer) gets arrested for his stage name, since it's a bee-thing. Sorry, but the wasps, bumblebees, mud daubers, yellow jackets, stingrays, hornets, scorpions, platypuses and jellyfish would like to have a word. Not to mention it has connotations outside of the animal kingdom. Especially baffling as the name "Sting" is actually trademarked to professional wrestler Steve Borden, who has the Animal Motif of a scorpion. Artistic License  Physics: The whole "bees can't fly" thing. That only applies to fixed, airplane style flight. If you take into account that they flap their wings, well, then bees can fly. As His Bee Self: "You know there's a Larry King in the Human world too!" Big Applesauce: All the plant life in the world is saved—once Central Park is restored, first. Courtroom Antic: While waiting for the Smoking Gun to arrive, Adam stalls by teaching the jury how to make paper boats. Dateless Newspaper: Averted, which for a CGI film is pretty much unique. Evil Lawyer Joke: "Well, I was already a blood-sucking parasite! All I needed was a briefcase!" Fantastic Aesop: The first acts seem to be preaching an aesop against human exploitation of animals, but then flips the message around in the ending act. It's okay to eat honey as long as it comes from sapient bees that give you permission. Fantasy Twist: Barry's daydream about Vanessa and himself having a romantic picnic together ends abruptly as Vanessa pilots a yellow and black ultralight to fly with him, then crashes and burns when she tries to duplicate an aviation feat only bees can accomplish. When the defense presents their opening statements and case before the plaintiff does (when the plaintiff outlines what the matters in contention are), there's an obvious logical, let alone legal, problem. The court case is done in a courtroom in New York City, rather than the Supreme Court of the United States which is in the district of Columbia, which borders Virginia and Maryland, not the state of New York. Ergo, any patent rights the bees are granted wouldn't be applied to the rest of the United States, let alone the other nations in North America, Canada and Mexico. Not just that but they're going after "all of humanity" - THE REST OF THE WORLD. Countries like China, the United Kingdom, any nation in Africa, and North Korea (the lattermost being completely hostile to the United States) are not going to stop honey production because ONE court case in the United States, and not even the Supreme Court, ruled in favor of bees. The settlement demand of "We will no longer tolerate derogatory bee-negative nicknames" probably violates the First Amendment right to free speech. Especially jarring with the two guys who seem to work at the honey plant just because they enjoy sadistically torturing bees. It might just be those guys, to be honest, but those are the only two workers Barry sees, which might contribute to the whole thing. Ink-Suit Actor: Barry is just Jerry Seinfeld with wings and stripes. Also, Ray Liotta and Sting both appear as themselves. The primary purpose of Bee Larry King's one scene interviewing Barry on BeeNN is lampshading his similarity to the human version. Male bees don't sting. The stinger is a modified ovipositor that only female worker bees have. On top of that, there's no such thing as a male worker. In a beehive (as well as an anthill and a wasp's nest), all of the grunt work is done by the females. This includes pollinating, which the movie shows male bees doing. Really, the only purpose of a male bee in real life is to mate with the queen, then die. Interspecies Romance: Barry and Vanessa. Not to mention Barry's uncle and the cricket in San Antonio. Jerk Jock: Averted. Early in the movie there's a scene where it looks like the pollen jockeys are going to turn out to be like this, inviting Barry along on their next scheduled nectar run to mess with him, but when he actually shows up, they're perfectly happy to show him the ropes and are quite personable about the whole thing. Perhaps played straight with the Patrick Warburton character, though, given how he's played as an antagonist and is a tennis player. Just Plane Wrong: Aside from everything else that's obviously wrong with the entire scene, Vanessa is shown pulling the landing gear handle to shut down the plane's engines. Ken... voiced by Patrick Warburton, no less. Lawyer-Friendly Cameo: Pooh and Piglet appear in one scene, with Piglet wearing a green sweater instead of magenta. Make the Dog Testify: The courts don't bother making sure the bees can speak before allowing them to sue humanity. Meaningful Name: A florist named Vanessa Bloome (Bloom). As well as a bee named Barry B. Benson. Mouse World: Inside a beehive is a fully functioning city practically indistinguishable from a PG-Rated New York City. Mundane Made Awesome: Deliberately. Barry has a swordfight with a shelfstocker wielding a pushpin. Nice Job Breaking It, Hero! : To quote Mr. Montgomery after Benson won the lawsuit, "This is an unholy perversion of the balance of nature, Benson! You'll regret this." Turns out that now that the bees were put out of the job due to the honey being "brought back" to them, the pollination halted and the plant life was slowly dying out, with the rest of the food chain about to follow soon. Crickets make their characteristic noise by rubbing their legs together. THAT is the "innocent" interpretation. Mr. Montgomery interrogating Barry if he lives with Vanessa and if he's her "little bedbug." When giving his final statement in court, Barry asks "is this what nature intended for us? To live out our lives as honey slaves to the white man! ", while the scene cuts to Montgomery's four lawyers, one of whom is black (this person then awkwardly shifts his chair away from the others). The discussion between Barry and Adam about who the girl Barry met is. Apparently, spiders are thought of as very hot due to having eight legs. Pinch Me: Vanessa stabs the back of her hand with a fork to wake herself up when Barry talks to her for the first time. It hurt a lot. Playing Games At Work: The director of the Honex Industries can be seen playing a hexagon-shaped Solitaire at his computer during Barry's motivational speech at the end. Justified in that at the time, the honey production was shut off and the bees had nothing to do. Pun-Based Title: It's rumored that the title began as a joke Jerry Seinfeld made to Steven Spielberg, who pointed him to Jeff Katzenberg to make it into a movie.note The rest of the conversation supposedly went "We're creative people with lots of money. We can do whatever we want!" Yes, really. Seinfeldian Conversation: It is Seinfeld as a bee. Vanessa: (Looking down at two unconscious pilots) What happened here? Barry: I tried to talk to them! But then there was a Dustbuster, a toupee, a life raft exploded! Now, one's bald, one's in a boat, and they're both unconscious! Serious Business: The montage where the honey is reclaimed. The ATHF holds a little old woman stirring honey into her tea at gunpoint. They even shoot Winnie-the-Pooh with a tranquilizer dart! Pooh's adventures will never be the same anymore. Barry B. Benson is named in honor of Jerry Seinfeld's first television role in a guest spot, playing a character named Barry on an episode of Benson. "Turn your key sir!" from the movie WarGames, a film that Matthew Broderick (who voiced Adam) starred in. Shown Their Work: It's clear the company did a fair amount of research, then overruled it in favor of the Rule of Funny. Smoking Gun: Used literally. Barry shows up with a smoke gun used to calm down honeybees. Bees win the case against humans. Barry: Didn't you say John Travolta was a pilot? Barry: How hard could it be?!?! What Happened to the Mouse? : Ken disappears from the plot following his confrontation with Barry, though he returns for a moment at the end to express his frustration at Barry "living his life", and Mr. Montgomery disappears from the plot after Barry wins the trial.